The hot water lever on the faucet will not move/work. The dual hot/cold faucet has a built-in safety mechanism for the hot water. The hot water lever has a red dot on the top. Push down on the red dot, noting there is a spring mechanism built into the lever assembly. While the lever with the red dot is depressed, the user can then move the lever downward to release the hot water. The cold water lever does not have this spring mechanism built into the lever and can simply be moved down for water. Water is not hot or too hot. Check if power supply to the heating tank is ok. If the power supply is ok, turn the temperature control knob clockwise as far as possible. Wait for 15 minutes and check the water temperature. If the water is still not hot; Turn the temperature control knob 3-4 times clockwise and counter clockwise and then turn the control knob clockwise as far as possible Wait for 15 minutes and check the water temperature. If the water is still not hot, there may be problem with the internal heating mechanism or thermostat contacts are stuck. Hot water continuously sputters and steams from the spout. After the hot water has been dispensed during normal usage, the tank immediately starts the reheating process which brings the water temperature back up. During this time it is normal that the spout may drip for few minutes while the water is reheating in tank. What you see is steam condensing in the faucet. If the Water dripping is continual it could be low water pressure to heating tank. Please check for any kinks, loops, and low suction in the faucets tubes. Solution: Check if water supply valve is fully open. There should not be any obstructions or any kinks or loops in the faucets tubes. It is better to have the tank installed close under the faucet to avoid kinks, sag, and loops. If a Filter is connected in line, check if the water is flowing out with normal pressure. Water is dripping from the spout. Low water supply pressure below 35 psi to the heating tank. The Faucet water supply tubes may have a kink, loops, or a section that is positioned too low causing abnormal water flow. There should be no obstructions such as any kink, sag or loops in the faucet tubes. Check water supply valve is fully open. Check the water pressure should not be below 35 PSI. Low water pressure will cause the expansion chamber not to function properly. If a Filter is connected in line, check if the water is flowing out from the filter with normal pressure. My water has bad taste or a bad odor. 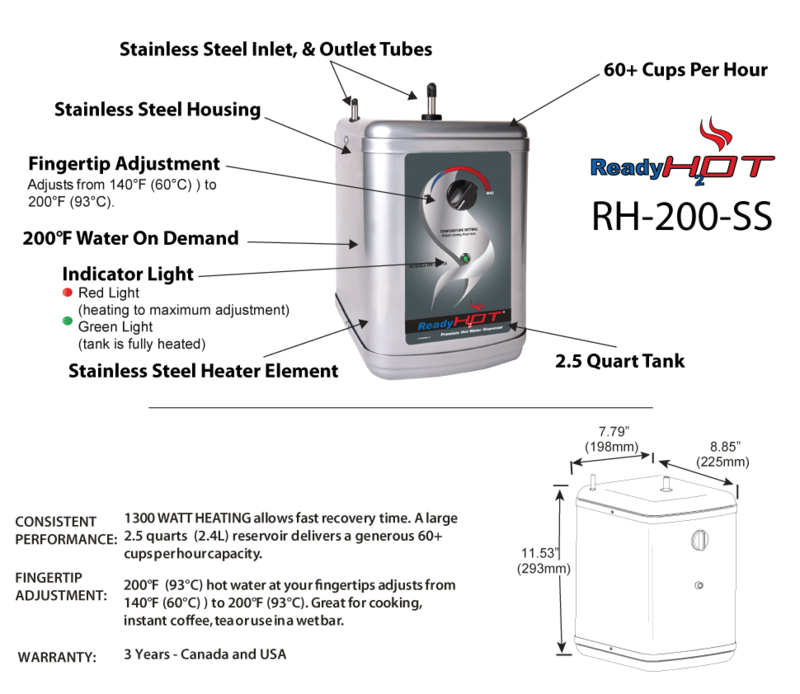 Our Hot Water Dispenser and Faucets utilize food grade NSF approved plastic tubes and stainless steel. The most common cause of bad taste or odor is using unfiltered water. However, this should only occur if you have had this similar problem in the past. The other common cause is by using plumbers putty used for sealing threads on plumbing connectors or newly repaired plumbing fixtures, pipes feeding the hot water tank. This results in a bad odor and can be cured by purging the hot water tank and cleaning any possible collected debris from the tip of faucet. The hot water tank and faucet should not be providing any odor or bad taste on its own. The thermostat activates the heater after water temperature in the tank drops approximately 15°F (8°C) from the maximum setting. If a water filter is connected to the inlet line, change the filter element at recommended intervals or often. If lowering the thermostat setting does not stop the boiling, unplug the power supply cord and contact customer service.